Coeur d'Alene Elementary 'Spring-a-palooza': May 11th! - Yo! Venice! Home Abbot Kinney Blvd Coeur d’Alene Elementary ‘Spring-a-palooza’: May 11th! Coeur d’Alene Elementary ‘Spring-a-palooza’: May 11th! 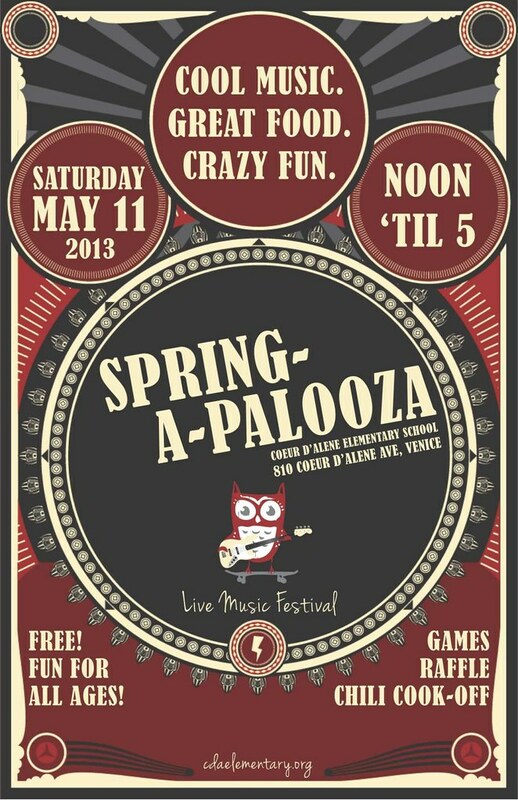 The Coeur d’Alene Elementary “Spring-a-palooza” will be held on May 11th this year from noon to 5pm! The festival will feature “fun booths for art, crafts, and games, a FUN Zone, Food Corner and two music stages where our students will perform as well as local bands”. “Spring-a-palooza” is one of Coeur d’Alene’s biggest fundraisers, raising money for art, PE, music, technology, the school library, library assistants and more! We will also have a silent auction – amazing restaurants and businesses have donated gift certificates – GREAT DEALS! We are also have a RAFFLE! Bring your homemade chili for our Chili Cookoff. There are so many ways to enjoy the after noon at your local public school! Join us!